Part of the reason I am blogging from the cold front of Utah, and hubby is baking in the heat of Sao Paulo is because I just cannot be without a stable internet connection due to my job. We agreed that I would spend time with the grandparents and great grandparents (meaning the baby of course), for Christmas. This is hard, but we figured manageable with the technology today. Today was my husband’s first real day in Brazil, so my first official report of life in Sao Paulo. Our church is close and the people are all genuinely nice. There are a few who speak English, but he said we will be attending a ward in Portuguese! Ack, maybe I should study better. At church he met an American guy who was visiting on business, so they got together and did some exploring. They (and I guess the rest of Sao Paulo) headed to Ibirapuera Park is right next to Moema. The park is one of the reasons we are considering moving to Moema. Having a monkey and living next to a park is a huge deal for me 🙂 He said the park is like the beach in LA, everyone goes to hang out, work out, and even tan. They then headed over to the mall for lunch… why both of them decided to eat at Pizza Hut while in Brazil is beyond me. But he said a slice of pizza and coke was about $15R. Kinda steep right? So how does this translate into reality? Well as this isn’t just a hotel room but living quarters for the next month, one would think they would give us the room with the full kitchen. Nope. The Jacuzzi tub is interesting- it’s a shower with a tub that has jets. Kinda disgusting. And here is a brief tour of the room. Forgive the quality, it took us an hour to get connected as Broadband internet really translates into… “not dial up but not great.” Checking email was a chore and half the time hotmail timed out. You’ll notice the “poop bucket” conversation. This is in reference to the garbage can that one is to throw their toilet paper in. Yes that’s right, no flushing here. The American he met is staying at a similarly priced hotel that is better, so he may be moving hotels. For now this is the hotel that we are calling home (or at least hubby is). 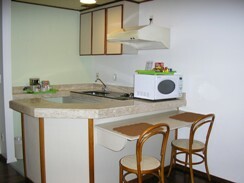 Posted in Cost of Living, Internet, Sao Paulo and tagged Sao Paulo Hotel, Unique to Brazil. Bookmark the permalink.